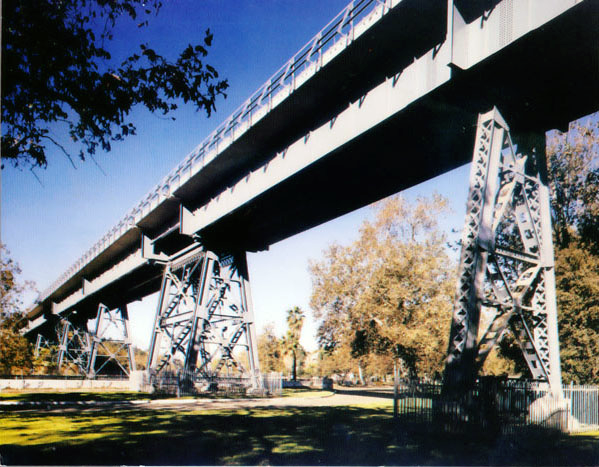 Built in 1896, this bridge replaced an 1889 vintage wooden trestle for the Southern California Railroad, which was a wholly-owned subsidiary of the Santa Fe Railroad. The bridge was rebuilt in the 1990s to accommodate two sets of tracks for the Los Angeles MTA’s Gold Line light rail. This bridge is the tallest and longest railroad span in the city of Los Angeles. Had it not been declared a monument prior to MTA acquisition, it might have been replaced with a concrete freeway style structure.